I’m trying to get some drum kits off of the LSDJ section of your website. After I download and unzip the file, I’ve just got one file that is of an “unknown file type”… what do I do!? Hello Quinn. As with any LSDj kit, you should use the LSD-patcher application, which can be found here. I have the patcher but it can’t open the file? I would assume the file is a collection of all the seperate kits made by rex but I’m not sure, which is why I feel like I’ve done something wrong. It just says “File Error” when I try to import the file that I get from your site. Can you tell me exactly which kit this happens for? Does this happen for all of the kits? 1. Click the Rex42-kits.zip file on your page. 2. Choose “Save File”/Click okay. 3. After the download is completed I open the folder and click “Extract all files. There are two files present. A MAC version, and one just called rex-42 kits. 4. I choose my version of LSDJ and then attempt to open the rex-42 kits file in the file patcher… file error. These archives contained special Mac OS X control files which may have caused the problem you’re describing. Rex42-kits should still have appeared as a folder, but apparently it didn’t. I’ve uploaded new versions of all the files. Please try downloading them again now. The folder is there now and everything is working perfectly Thank you very much good sir! Really appreciate it! 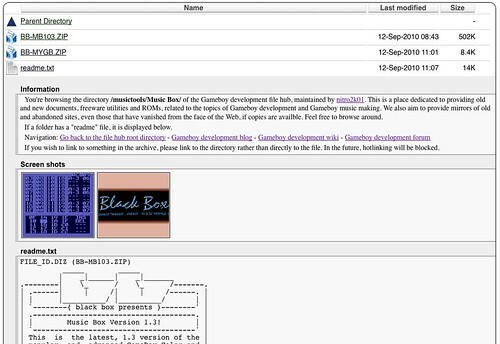 This page was previously hosted on http://gameboygenius.8bitcollective.com/wordpress/2010/09/14/gameboy-development-and-music-tool-file-archive/ (*).